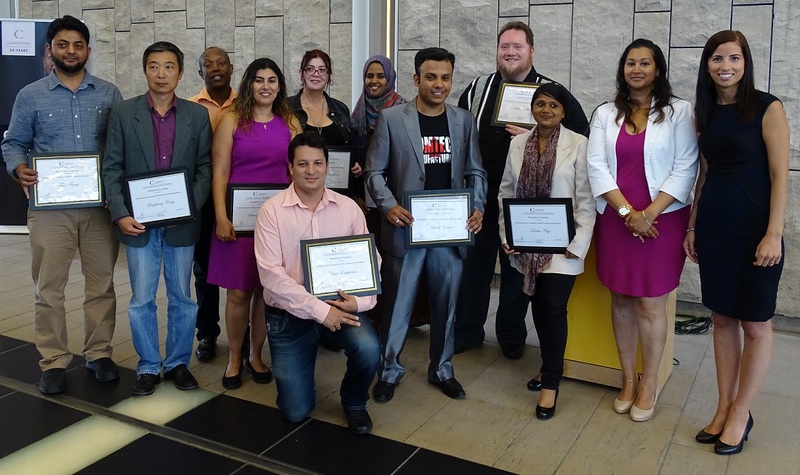 On August 22, Conestoga celebrated the graduation of the first cohort of clients to complete the Self-Employment for Immigrants: Building Entrepreneurial Excellence program. The 16-week program was delivered free of charge thanks to funding provided by Immigration, Refugees and Citizenship Canada. Graduates of Conestoga's Self-Employment for Immigrants: Building Entrepreneurial Excellence program were recognized at a graduation celebration held August 22 at Waterloo Region Museum. “I’m happier than I’ve been in a long time,” said Rob Morris in an address to the graduates and guests at the celebration. Morris said that as recently as five months ago he wasn’t sure what he wanted to do or what direction his career would take. Through the entrepreneurship program he’s taken a hobby and developed it into a business with multiple clients. He’s tapped into a niche market with Ullr’s Table, and now provides custom work for hobbyists and gamers who want their game pieces and miniatures painted. He is also heavily involved with SKYCON, a gaming event scheduled for Kitchener this October. “Don’t give up,” he told the other graduates. “It’s been easier for me because I’ve been here 15 years; most of you have only been in Canada five months.” Morris is from the U.S., while others in the program have come from countries that include Iran, India, Indonesia and Columbia. As part of the celebration, graduates shared pitch presentations for the business ideas they developed and refined throughout the course of the program, which started in May. Pitches ranged from furniture refinishing and window treatment services to a ride sharing app and development of electric vehicle charging stations. Common threads running through the presentations included each entrepreneur’s interest in contributing to the success of the region, and their gratitude for the support received from Conestoga and Immigration, Refugees and Citizenship Canada. Sanaz Hosseini, from Iran, holds two Master’s degrees, but turned to the program to get practical support and guidance to launch her business, a startup to help improve gender imbalances in the workplace by assisting companies to hire and train female employees. She was eager to share the success story of another graduate, Safa Qoussini, who is already running her business in the region - a STEM robotics camp. "The first intake for the program was a great success," said Tina Allishaw, manager of Community Partnerships and College Collaboration at Conestoga. "We are very pleased with the curriculum outcomes and our clients' achievements. It’s great to see businesses take shape and the impact this program has had on these wonderful individuals and the community. We look forward to the upcoming intakes and extend our appreciation and thanks to our funding partner, Immigration, Refugees and Citizenship Canada." Throughout the program, clients received entrepreneurship training to set up their businesses, support from Conestoga’s Centre for Entrepreneurship, mentoring sessions and opportunities to tour local think tanks and incubator hubs in the region. The 13 graduates received a Certificate of Completion to recognize their success in the program. The Self-Employment for Immigrants: Building Entrepreneurial Excellence program is now accepting applications for the next delivery in October. For more information, contact Nicole Marostega at 519-748-5220, ext. 3448. Conestoga provides a range of employment pathways and academic programs specifically designed to help immigrants with their transition and integration into Canada. Services are tailored to individual needs and include academic and language testing and credentials assessment. Visit the Conestoga website for more information.